The daily ritual of scraping metal across your face, chin and neck has the potential to get your day off to an uncomfortable start. After trying countless varieties of shaving creams over the years, I think I’ve finally found “the one”. 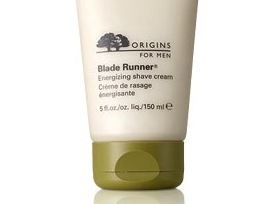 The Origins Blade Runner is an energizing shaving cream that creates a bit of a lather. I prefer creams to the gel, as I find the stubble gets a lift with the cream and it seems to soothe and provide a smoother path for the blade (but, if you are fond of gel you might try this one). There are not too many reviews out there for Blade Runner. I find the lather to be more soothing than, say, the Body Shop Maca Root Shaving Cream. And, it goes on a bit thicker than the Nivea, Neutrogena or Gillette brand shaving creams and gels – I have tried all of these. My typical routine involves washing my face with hot water, then applying the lather. I prefer not to shave in the shower or after. Of course, the blade is a Gillette Fusion Proglide – expensive but no other real competition. The bottom line: Found this to be excellent for my sensitive skin, and helps give a close shave without razor-burn even with short stubble, definite recommendation.